Oh, no! Polly’s DEAD? Life Size Realistic Creepy ZOMBIE SKELETON GHOST PARROT DEAD BIRD Pirate Prop Building Decoration. Skeletal Aviary Walking Dead inspired Parrot is here to greet your Halloween Haunted House and Horror Circus Carnival guests. This ghostly animal spirit is a scary addition to any Pet Cemetery, Freak Show, Pirate Den or Haunted Luau display. 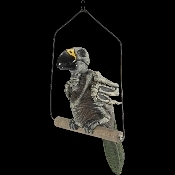 Hard Plastic Parrot Bones with swivel wings resting on wire hanging perch with chain. Static prop figure Parrot approx. 12-inch long from head to tail x 4.5-inch wide x 5-inch deep (30x11.25x12.5cm). Wired perch approx. 10-inch long x 7.5-inch wide. Total length with hanging chain approx. 10-inch (25cm). The ultimate in spooky decor. Perfect for a haunted house or home display.